Heat illness, vomiting and diarrhea are some of the ways in which the body can lose a significant amount of water and salts. Once the quantity of water and salts in the body reach a lower than normal level, a person is said to be dehydrated. Various functions are affected including blood flow, thickness of the blood, heart activity and kidney function to name but a few. The elderly are often at greater risk of suffering with severe complications from dehydration since they more frequently have pre-existing diseases of the blood vessels, heart and kidneys. While dehydration can be life threatening to a person of any age, death is more likely in the elderly as the brain, heart and kidneys shut down. The key to preventing dehydration in the event of water and salt loss for whatever reason is to use oral rehydration solutions (ORS). Only if this is insufficient to maintain the fluid and electrolyte levels then an IV drip needs to be set up. What are oral rehydrating solutions? An oral rehydration solution, often simply referred to as ORS, is a fluid and electrolyte mixture that is used to prevent dehydration. Due to the correct combination of electrolytes, an oral rehydration solution is able to more effectively prevent dehydration than any home tonic, sports drink or soda. However, these other alternate solutions can also be considered to be an ORS in some form, although not as effective as commercial varieties. Oral rehydration therapy (ORT), which is the term for administrating an ORS in the bid to prevent dehydration or death from dehydration, needs to be ongoing. Even after a person has stopped suffering with diarrhea or vomiting, an ORS should be continued for the next 2 to 3 days. It is not a means to substitute food. An ORS should be used at all times even if a person has severe nausea and is vomiting excessively. Cases of death by food poisoning, stomach flu, traveler’s diarrhea and heat stroke are usually as a consequence of dehydration. There a wide range of ORS brands on the market. These can be purchased from pharmacies and supermarkets. It contains a number of different salts in a combination that is less likely to aggravate conditions like diarrhea which may be the root cause of dehydration. Commercial oral rehydration solutions are usually available in a sachet form where the powder or granules can be added to clean drinking water. It may be flavored to make it more palatable. Homemade oral rehydrating solutions have existed in some form or the other throughout time. It was sometimes in the form of a simple broth and even includes solutions such as rice water which is easily available in the home environment in some regions. However, it has been found that the osmotic effects of some of these homemade solutions may worsen diarrhea and dehydration by drawing water out into the gut lumen. Therefore commercial solutions have a reduced osmolarity to prevent this effect. A simple oral rehydration solution can be made with a few basic ingredients in the home environment. The following ingredients need to be mixed together. 1 liter (about 30 fluid ounces or just over 4 cups) of clean water that has been boiled and cooled. The solution needs to be mixed thoroughly until the sugar and salt are completely dissolved in the water. It is however devoid of potassium, an essential mineral, which is why commercial solutions are the better choice. A few ounces of orange juice can add potassium to the mixture or even eating a small amount of mashed bananas will deliver some potassium to the system. Overall the homemade solution is often less palatable than the commercial varieties which can be quite unhelpful in a person with severe nausea and vomiting. 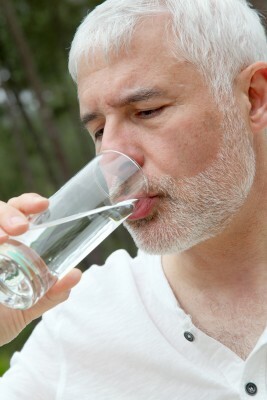 A person should drink at least 2 to 3 liters of oral rehydration solutions per day in the event of fluid loss. Larger amounts of ORS in a day are usually advisable but it also depends on a person’s ability to tolerate more than the 2 to 3 liters. Homemade ORS should be seen as a temporary alternative until a commercial ORS can be acquired. Medical attention should also be sought as oral rehydration therapy may not be sufficient in some cases. Hospitalization and an IV drip may ultimately be necessary.